For all its beauty, Sydney’s Observatory Hill is a site steeped in colonial history. On the land of the Gadigal people of the Eora Nation – land that was never ceded – Fort Phillip was built in 1800. It was an important signal station and military outpost before Sydney Observatory was constructed in 1858. Now a museum, it is an imposing building that speaks of a new colony’s eagerness to prove itself, staking a claim with its scientific ability to chart the stars in the sky and navigate the sea. 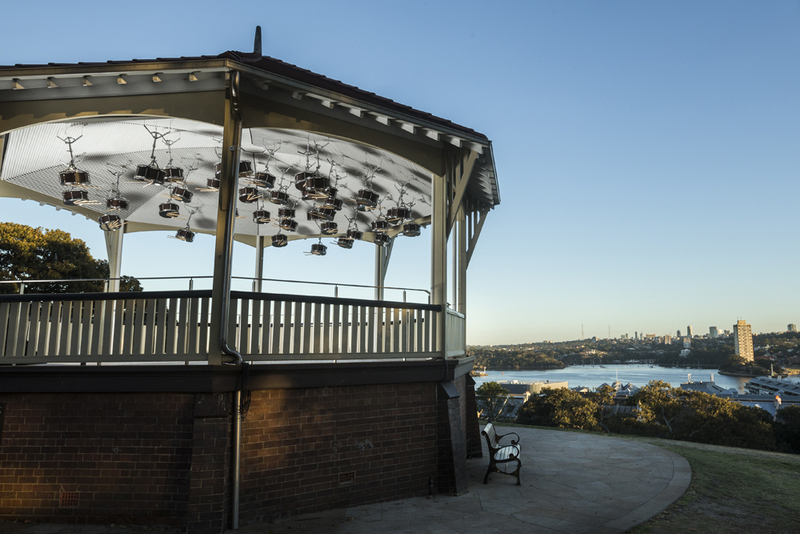 It is within the historic rotunda on Observatory Hill that the French-Albanian artist Anri Sala has constructed The Last Resort, the 33rd Kaldor Public Art Project. 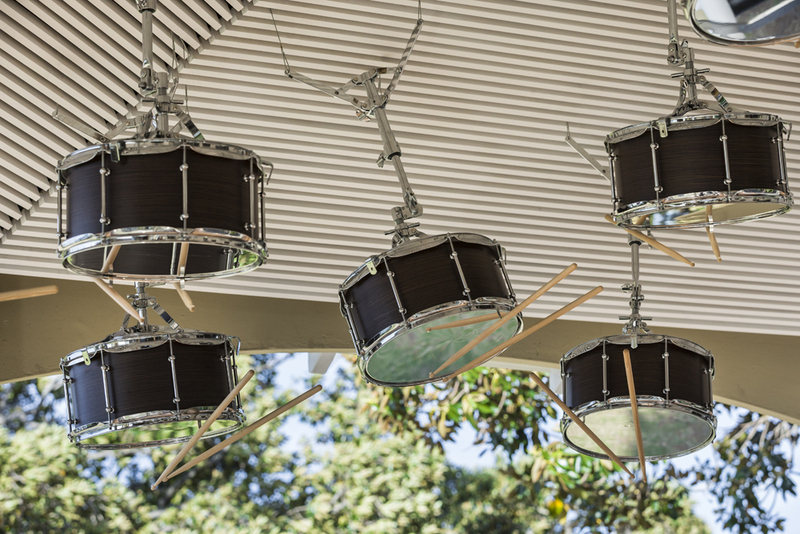 The work sees thirty-eight custom snare drums suspended from the ceiling of the rotunda. Hidden speakers within each drum play a reworked version of Mozart’s 1791 Clarinet Concerto in A Major. The sound emanating from each speaker causes the drums to vibrate, triggering a kinetic response – drumsticks tremble and pulse, hitting against the inverted skins. I do not doubt the level of Sala’s research into the project or his stated motivation to link Mozart’s reworked concerto with the arrival of early settlers to Australia. And, as a public art installation, The Last Resort is indeed an engaging work. On one of the several times I visited, a group of first grade school students were sitting crosslegged and looking up in slack-jawed wonder at the vibrating drums. The round space of the rotunda makes the experience of viewing the work particularly communal: people speak in whispers, some meander over to the railings, looking out towards the languid harbour before turning around to gaze at the drums above them. The moments when the concerto aligns with the rhythm of the vibrating sticks is pure delight, and the shifts and changes mean that many stay with the installation for long periods of time. But these aspects of the work cannot stop me from levelling the charge that The Last Resort is also an insufficient, or at the very least, naïve response to our colonial history. The motif of drumsticks hitting against inverted drums has recurred across some of Sala’s previous works, including ‘Bridges in the Doldrums’ (2016), and as part of his New Museum retrospective Anri Sala: Answer Me in 2016. This leads me to think that even the use of the drum itself is neither a site-specific reference to the instrument’s military history nor its connection to British colonial regiments. If the work is commenting on anything it is the feeling of fragmentation and disorientation of those arriving in an upside-down antipodean world. To put it another way, it speaks to the experience of the colonisers rather than the colonised. This is not to do with the aesthetics of Sala’s work – that it is too beautiful and grand and therefore unable to be critical. Indeed what is so frustrating about this installation is that the last Kaldor Public Art Project by artist Jonathan Jones was a rigorous and thoughtful response to Indigenous suffering and the erased reminders of violent colonisation. ‘barrangal dyara (skin and bones)’ (2016) saw thousands of bleached white shields mark out the site of the 19th century Garden Palace in Sydney’s Royal Botanic Gardens – a lavishly purpose-built exhibition building that was constructed in 1879 before being engulfed by fire in 1882, taking with it hundreds of culturally significant Indigenous artefacts. It was a work that was both stunning in its execution and uniquely responsive to its surroundings. It prompted conversation and reflection around an important event in Australia’s colonial history that was for many previously unknown. Public art should be accessible, engaging and formally ambitious. But it can and should also provoke and question, especially when it is aligned with our colonial past. The Last Resort is not just a contemplative sound installation, it claims to be doing more than this – and it is in making this claim that Sala’s work falls short. Author’s note: all quoted text taken from the Kaldor Public Art Projects free exhibition text, ‘Anri Sala: The Last Resort’ (2017).